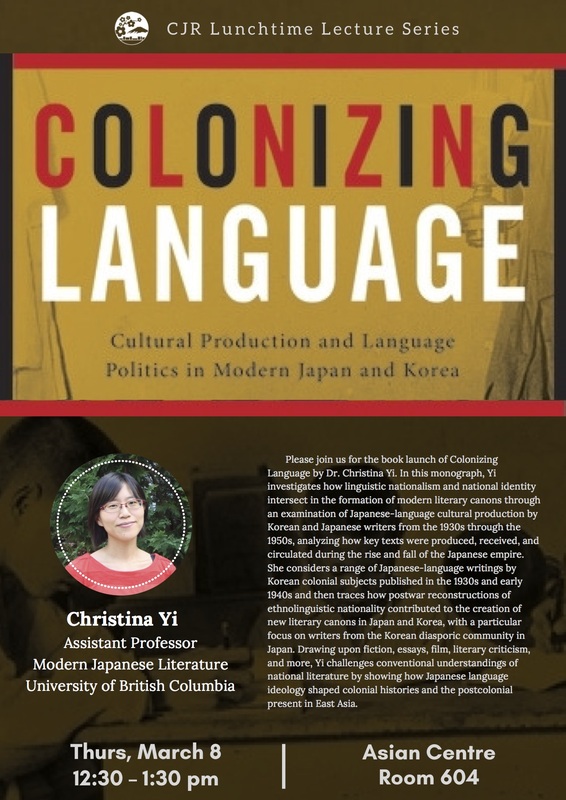 Please join us for the book launch of Colonizing Language by Dr. Christina Yi. In this monograph, Yi investigates how linguistic nationalism and national identity intersect in the formation of modern literary canons through an examination of Japanese-language cultural production by Korean and Japanese writers from the 1930s through the 1950s, analyzing how key texts were produced, received, and circulated during the rise and fall of the Japanese empire. She considers a range of Japanese-language writings by Korean colonial subjects published in the 1930s and early 1940s and then traces how postwar reconstructions of ethnolinguistic nationality contributed to the creation of new literary canons in Japan and Korea, with a particular focus on writers from the Korean diasporic community in Japan. Drawing upon fiction, essays, film, literary criticism, and more, Yi challenges conventional understandings of national literature by showing how Japanese language ideology shaped colonial histories and the postcolonial present in East Asia. Christina Yi is an assistant professor of modern Japanese literature at the University of British Columbia. She received her Ph.D. in Modern Japanese Literature from Columbia University. Her research primarily focuses on Japanese-language literature by ethnic Korean writers from the 1930s to the present. Her most recent publication is a monograph entitled Colonizing Language: Cultural Production and Language Politics in Modern Japan and Korea (Columbia University Press, March 2018).